It's that time of the year again. April 15 marks the death of Hu Yaobang in 1989, which sparked the student movement that year. 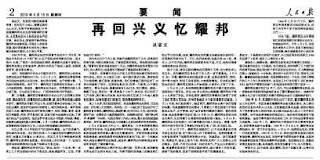 In the years past, there has only been occasional, but rather scarce mention of this anniversary in the official media in China. It is therefore quite surprising to see that today's People's Daily carries an article by Premier Wen Jiaobao as a remembrance of Hu Yaobang. In the article, Wen Jiabao movingly describes how he was a staff member in Hu Yaobang's entourage when they toured the vast rural areas of China more than 20 years ago. He remembers Hu Yaobang as a man of the people who had worked hard to bring the country out of her desperate poverty. Quite interestingly, Wen Jiabao mentioned that, "in the January of 1987, after Comrade Yaobang was no longer an important leader of the Party Central, I visited him often." He also claimed that he had always been at Hu Yaobang's side after the latter's heart attack on April 8, 1989 and have been visiting Hu Yaobang's family during the Spring Festival every year since his passing. It is quite a strong hint on the history of Hu Yaobang's downfall from the sitting Premier.